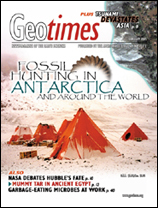 Order your free trial copy of Geotimes today! Take advantage of your special promo code here. Do you think alternatives to evolution should be given equal time in the science classroom? A team of paleontologists explored the barren Antarctic to look for fossils of marsupials that once traveled through the continent, but instead found another fossil surprise. Collecting fossils is a hobby beloved by people of all ages and backgrounds and one that has boomed into big business at shows and on the Internet. The causes of major extinction events throughout geologic history are more complicated than simple asteroid collisions. Mid-ocean ridge spread or jam? Throughout the western United States, dinosaur dude ranches offer families the opportunity to dig fossils for a day. From genetically charting ancient creatures to creating vast cyber-databases  many challenges and new lines of exploration lie ahead for a field scientists recently thought was in decline. The lame duck Congress was action-packed, with budgets and intelligence reform on the floor. Hardened tools seem custom-made for the hardy geologist. In Memoriam: Thomas Wilson Dibblee Jr. 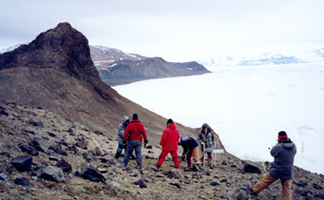 Conducting research in Antarctica is tough work, as paleontologists recently learned on a fossil-hunting expedition. Regular snowstorms give way to extremely dry conditions that sublimate the frozen precipitation. Read story on page 18. Antarctic photo by James Martin; ammonite photo copyright of Oklahoma University. Upper right: After a magnitude-9.0 earthquake and ensuing tsunami waves on Dec. 26, water flowed out of the inundated area and back into the sea, creating turbulence offshore Sri Lanka. Read story on page 8. Photo copyright DigitalGlobe.